Armin Redinger is a German artist now working in London. Originally from Bavaria, he was connected to and exhibited his paintings with a group of like minded artists before broadening his knowledge and experience through world travel. He spent much time in India, North Africa and Europe, settling in Crete for a period until his move to England in 1987. Here he resumed his art work and attended the University of East London, attaining a 1st class honours degree in Fine Art. His earlier works were mainly in oils. 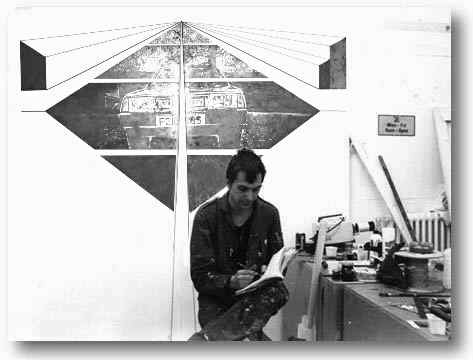 The transition to his current style began with experiments in installations. He became interested in metals and how they could be worked and manipulated to produce different results. With the use of acid etching and controlled rusting he has created a unique and exciting style which he describes as 'painting with metal'. His dynamic use of perspective and extended steel rods and wires adds to the effect, so that his pieces appear to be sculpture and painting at the same time. The freshness and ingenuity of his work has generated a lot of interest from many different quarters. His unorthodox use of materials can also be seen in his later abstract paintings, where he has used spray paints, traditionally associated with graffiti, to great effect, showing that only imagination, not the medium itself, limits the achievable results. It is his wonderful use of colour which has made his paintings and prints so popular. Any enquiries about his work can be sent via the 'Feedback' and 'Contact' links. We also welcome any kind of comment.